If you’ve been around a smartphone in the last few weeks, chances are you’ve played – or at least heard of – Flappy Bird. A free to play game available on iOS and Android, millions of users have become addicted to its simple gameplay: just tap to keep the bird afloat, and navigate your way between a series of pipes. Yet what seems relatively easy is actually fiendishly difficult, with a steep learning curve that proves infuriating, yet somehow keeps players coming back for more. Now a global phenomenon, Flappy Bird has reportedly been earning developer Dong Nguyen around $50,000 per day from in-game ad revenue, a remarkable turnaround for a game which was initially released to little fanfare in May 2013. As a result of this sudden success, Flappy Bird’s rise to the top has been punctuated with controversy. Nguyen has been accused of employing bots in order to boost Apple App Store rankings, and plagiarising aspects of other games’ artwork and gameplay mechanics. 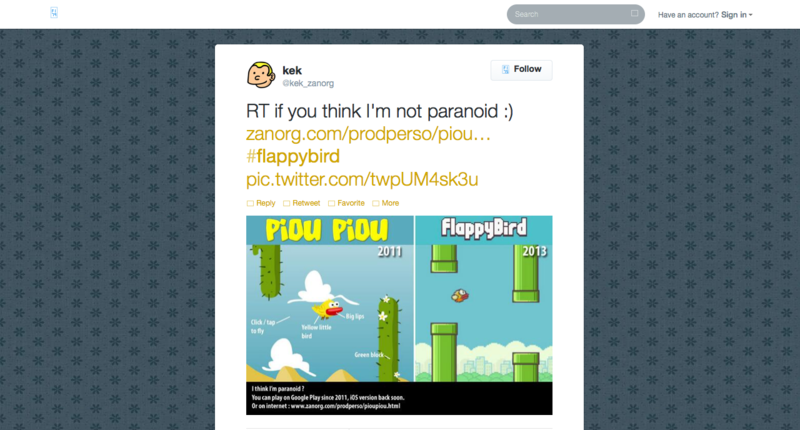 Conversely, some claim that the attacks on Nguyen are a result of developers’ jealousy and have rallied to his defence, arguing both for Flappy Bird’s status as an innovative game experience, as well as Nguyen’s protective stance in the wake of his success. 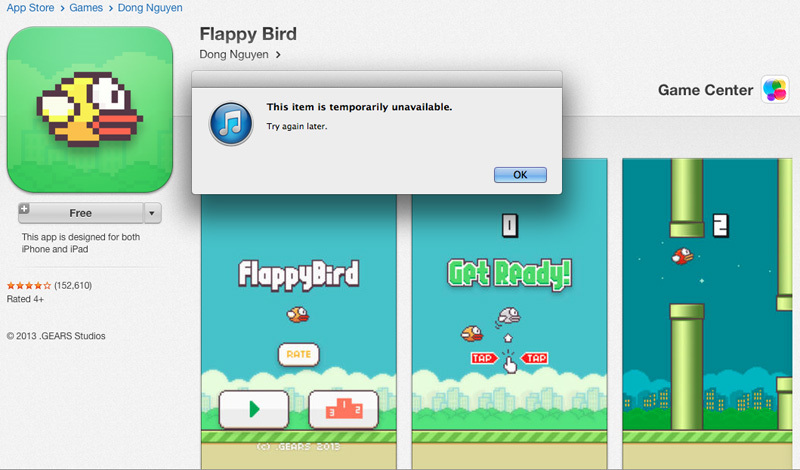 Yet persistent and prominent attacks via social media led to Nguyen deciding to remove the game from the marketplace on 9th February, a move described as ‘either a diabolical or accidentally genius’ piece of marketing, and prompting a flurry of Flappy Bird copycats to be released in its wake. What has been interesting for me to observe during the Flappy Bird saga (my current top score is 55, by the way) is how a number of the points of discussion surrounding the game, its development, and its monetisation, reflect topics discussed at a workshop organised as part of WP1E ‘Copyright and Games’. Held on 6th December 2013 at the University of Edinburgh, the event unfortunately coincided with the extreme weather conditions which temporarily caused travel chaos across Scotland. Although we were fortunate that the majority of our participants were ultimately able to attend, the decision was made to truncate the planned four shorter sessions into two slightly extended ones, allowing for an earlier finish to combat any other potential travel difficulties. The workshop was thusly split into two parts; in the morning, the group would discuss Business Development and Intellectual Property, with the afternoon dedicated to Transmedia and Industry. Specifically covering details from the morning session, here I reflect on how participants’ discussion not only prompted some interesting and fruitful debate, but has also proved timely in its relevance to current trends in the videogame sector. Daithí Mac Síthigh, Keith Johnston, and I are immensely grateful to the following games industry experts and personnel for their attendance and participation: Brian Baglow, Chris Bruce, Ben Farrand, Yin Harn Lee, Nicoll Hunt, Rami Ismail, Ifty Khan, Rick Lane, Elaine Reynolds, and Matt Watkins. The morning session began with a discussion of the tension between artistic and business concerns of videogame development, allowing the panel to discuss the idea of what “indie” actually meant, debating whether it was a practical or ideological position, and whether an indie developer should care more about the content of their game or the potential monetisation techniques that could be adopted or exploited. Could Dong Nguyen be classed as “independent”, for instance? He is an individual working alone to produce content, yet was apparently making the equivalent of $18m per year – such a commitment to monetisation could have undermined the perceived creativity of his games. However, there was a general conception amongst the workshop participants that there had been a sea change in the sector, where there was no longer necessarily a binary division between “independent” and “mainstream” game development, and that in fact such pointed distinctions between roles were irrelevant and outdated in today’s market. What was noted as important, however, was the need for openness and co-operation between content producers. Such a sentiment is reflective of my own experience of industry conference Develop, and fed into later discussion of how the industry could self-regulate legal issues pertaining to the protection of one’s own IP. For instance, one developer present argued that if they are aware of when something of theirs has been copied – through a familiarity with art work, code, and gameplay – why should a legal team come in and make the decision for them based on criteria that may not be wholly applicable or relevant? Particularly as a result of social media, the games development community has become more adept at self-regulation, but there still appears to be a barrier between this increasingly normalised method of regulation, and formal legal protection of one’s assets. Such a hurdle may be as a result of social media users’ proclivity for snap judgements – see for example the frequency with which Flappy Bird was accused of plagiarism – without necessarily understanding the difference between imitation and inspiration. What this highlights is that surrounding the sector, there remains a misunderstanding of the difference between legal standards, and those moral, ethical, and creative standards imposed by certain online communities. Plagiarism (or the perception of it) is not a legal standard; there is after all a reason why the Apple App Store has allowed games such as Fly Birdie – Flappy Bird Flyer, Flappy Plane, Flappy Bee, and Fluff vs Flappy birds to enter the Top 20 free games chart unopposed. That Flappy Bird and its decedents have featured in the free games chart is significant, and our participants took the opportunity to discuss free to play or freemium business models. In March 2013, it was reported that 71% of all Apple App Store revenue for the preceding month was derived from in-app purchases from free apps. The success of this model has subsequently meant that those consumers who frequently use microtransactions are now a desired userbase by some developers and publishers. The pursuit of such “whales” has been coded by some trade press in terms of ‘manipulation’ or ‘exploitation’, and developers who join this “gold rush” are either ‘honest prospectors’ or ‘claim jumpers’. Yet while obviously a hot button issue, and although agreeing that F2P and freemium are becoming the norm (particularly on mobile platforms), what was evident during our event was that different business models suit different companies. There is no single universal business model that can be agreed upon, nor is suitable for all. Although the European Commission is becoming concerned with some developers’ practices, our participants appear to feel that to take a binary view of such monetisation techniques is ill considered. In allowing us to sit down with industry leaders on behalf of CREATe, the workshop proved a great success. The issues raised and discussed across both sessions have helped our team formulate new directions with our research, and the workshop as a format was successful to the point that another may be beneficial. That so many of the themes covered are applicable to current affairs in the industry demonstrates the value of working closely with those invested in the sector on a day-to-day basis. The one caveat however, is that no matter how much time you spend with videogame professionals, sadly your Flappy Bird score will not improve.